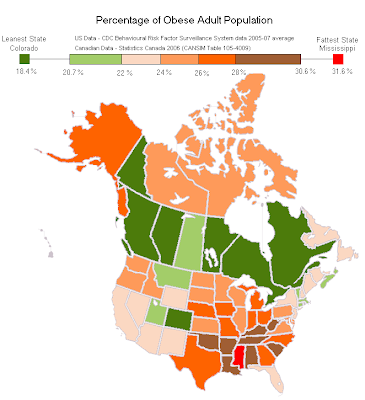 Not a huge surprise, but thanks to David Eaves (of the interesting blog Eaves.ca) we can see that if obesity rates in Canadian Provinces were ranked alongside American States, our Provinces place first through fifth. Before you get too excited, Nunavut and the North-West Territories fall into 30th place. Regardless of how you want to look at the data one thing's for sure - North America is one big continent and it's only getting bigger.